As the name suggests, Sardar Patel national memorial was established in the memory of Sardar Vallabhbhai Patel, who was a great freedom fighter. Located in the environs of Shahibaugh in Ahmedabad, Sardar Patel national memorial museum is also known as Moti Shah Mahal. The Moti Shahi Mahal is surrounded by the Sardar Open Garden, where peacocks roam free and monkeys reside in the trees. The Sardar Open Air Theatre shows documentary films in the garden on occasion. 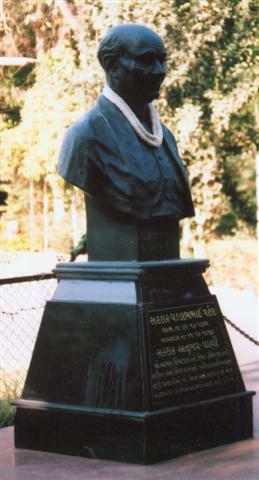 Before the palace stands a statue of Sardar Patel. Four pillars mark the four wings, one floor and central hall of the palace. The Moti Shahi Mahal was constructed by Mughal emperor Shahjahan between 1618 and 1622 at Ahmedabad when he was the suba, or governor, of Gujarat, which was a part of the Mughal Empire. After that the palace was in the control of the British Raj when Ahmedabad was established as a cantonment in the mid-nineteenth century, and used for government purposes. Rabindranath Tagore, the great Bengali poet, writer and philosopher stayed in the palace in 1878, when he was seventeen years old. Following Indian independence, this palace was the Raj Bhavan - official residence of the Governor of Gujarat, from 1960 to 1978. It was endowed by the Government of Gujarat in 1975, upon the centennial birth anniversary of Sardar Vallabhbhai Patel, to establish a memorial to honour him. The memorial was founded on March 7, 1980. The Patel memorial is located on the ground floor of Sardar Patel National Memorial, covering the central hall and four adjacent rooms. The central hall is filled with portraits of Sardar Patel, his family, friends and colleagues in the Indian freedom struggle. They are in chronological order and with biographical descriptions of periods of his life, and quotes by his colleagues and admirers. Two of the four adjacent rooms house relics of Sardar Patel's life, his personal possessions as well as displayed accounts and political cartoons from newspapers of the time. One room is devoted to a particular phase of Sardar Patel's work - his comradeship with Mohandas Gandhi in the 1930s, his youth, education and legal career, and his work as India's home minister in integrating princely states into India. In a room to the right of the main entrance into the palace, is where Sardar Patel's personal effects are on display. These include his khadi kurta, jacket and dhoti, his shoes, slippers and European-style clothes from his younger days. Also on display is a flag of India as created by the Indian National Congress in 1930-31. A major room and sub-hall on the ground floor is devoted to the controversial Sardar Sarovar Project - a major dam and hydroelectric power plants project launched in Sardar Patel's name in the Narmada river valley, covering the states of Gujarat, Maharashtra and Madhya Pradesh. The room contains pictures, graphics, books, statistics and other information on the project - from its inception, technical details, construction and present functioning. In a room connected through the Sardar Sarovar hall, the life and work of Mohandas Gandhi are on display. These include portraits, pictures, quotes, busts, statues and books. Gandhi's close partnership and personal friendship with Patel is an important and recurrent theme throughout the memorial. On first floor, in the right wing of the palace there is a room where Rabindranath Tagore lived during his time at the palace, and it is dedicated to his memory. It is accessed by a staircase and a pathway into the right column. There are numerous portraits, pictures and information on display, and the main room consists of a large statue of Tagore, including paintings to preserve his memory and contributions.